Today is the Feast of the Annunciation of the Blessed Virgin Mary, a celebration of the Woman whose fiat was used to God to change the world. It is at the same time remembered as the day of the Incarnation of Our Lord, the day that He-through-Whom-all-things-were-made became human, initiating His salvific mission on earth. It has also become, for this reason, the Day of the Unborn Child, celebrated around the world with marches for life. This Feast is a fitting time to remember that the peace of Our Lord, which entered the world with Mary’s “yes,” is not the same as the peace of the secular world. They may well overlap at times—a truly Christian society will be one of peace, though no society is so perfect that it removes the freedom of its people to sin, including committing violence. The one who loves Christ will not be violent, yet Christ’s peace cannot be reduced to mere non-violence. It is first an internal peace for the one whose love of God is such that his will becomes as much as possible conformed to God’s. His first priority is love and worship of God, and this love transforms his life and relationships, allowing him to love more and give of himself more completely. As a reflection of God’s own love, he becomes an agent of Christ’s peace in community and society, wanting to share the truth of the Gospel with all, and unafraid of the consequences of doing so. He cannot stand to see an innocent person before or after birth attacked and killed. He loves people and hates sin so much that no false compassion will stop him from loving the person trapped in sin, including telling him that he is, in fact, trapped in sin and that God’s mercy is readily available to anyone who turns from sin in humility and penitence. He knows that healthy families and a strong and faithful Church is the basis for any society capable of lasting peace. He knows that God’s law is the basis of natural law, which is in turn the basis for all legitimate laws in any society. I write this from Romania, where I’m on the second leg of a mission through three nations devastated by Socialism and Communism, by far the most destructive ideologies our world has ever known. Whether the Socialism was of the German National (Nazi) variety, or that of Soviet Socialist Republic of Russia, much of the region of Central and Eastern Europe remains a sad testament to its devastating reach. Yet it is fascinating how many signs of hope one finds here, well beyond the alarming headlines we often hear in America. The Church, though still regaining its bearings in some places, is strong. 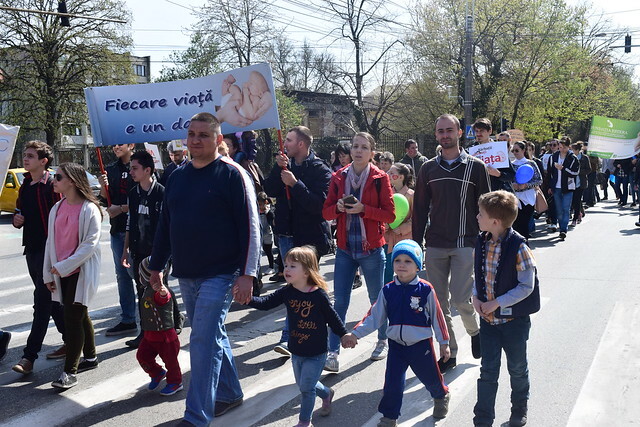 We just finished celebrating the Day of the Unborn Child with a March through Timisoara, one of 256 such marches in Romania alone. There is a reason people here are so engaged: They have seen up close the lies of “progress” in the attacks on life and family launched a century ago, and which are now ascendant in the United States and so much of the “developed” world. The errors of Russia spread here long ago, and are now increasingly being rejected. Governments are less afraid to honor both the family and the Christian roots of their cultures as they continue to emerge from the ruins, having seen that the family and Christianity were the primary targets of the Socialists and Communists. Even today, they see these errors again in the European Union’s soft despotism, which grows more and more confident in its attacks on marriage and the family, even as it rejects the obvious Christian roots of European nations. For their trouble, countries like Hungary, Romania, and Poland, where I’ll be going next, are actually (get the irony of this) being attacked for their supposed “anti-democratic” turns. I’m not kidding. The people elect leaders who actually represent their views (at least those of the traditional majority), and who reject the growing despotism of an unelected bureaucracy at the EU, and for this they are called “anti-democratic.” Yet some very aggressive and sometimes violent groups funded from outside the countries by billionaire George Soros and others promote abortion and the redefinition of marriage, and the media refer to them as promoters of “peace” and “democracy.” They are even sometimes called “anti-fascist” as they wear hoods and go on violent rampages—which is exactly what the fascist troops did around Europe in the last century. It would be funny if it were not so serious, and if the stakes were not so high. These countries have begun to slowly reject the extremely aggressive secularism that still reigns, because they have seen it in its darkest form. Yet we are embracing this corruption in America, even as it moves from a “tolerance,” “peace,” and “justice” to a fascistic anti-Christian wave that would punish anyone who stands in its way, especially if those in the way are defending unborn life and marriage and family. There will be no peace if we give in to them here, or anywhere. On this Feast of the Annunciation and Day of the Unborn Child, we must listen to our sisters and brothers in Eastern Europe, who, not coincidentally, have a great devotion to the Blessed Mother. We must also listen to Saint Paul. And to Saint Teresa of Kolkata, who said truthfully that in our day “Abortion is the greatest destroyer of love and peace.” Until we follow the Blessed Mother’s unqualified yes, we are relying too much on our own meager efforts, and peace will remain a distant goal. There is no lasting peace without the love of God coming first, without the Person of Jesus Christ being the first Love of our lives, as He was for Mary. This is why we worship our loving God first, and let Him transform who we are and all that we do.